Distance, where I’ve been, and getting personal – The official blog of Michelle Tuckett, word ninja. 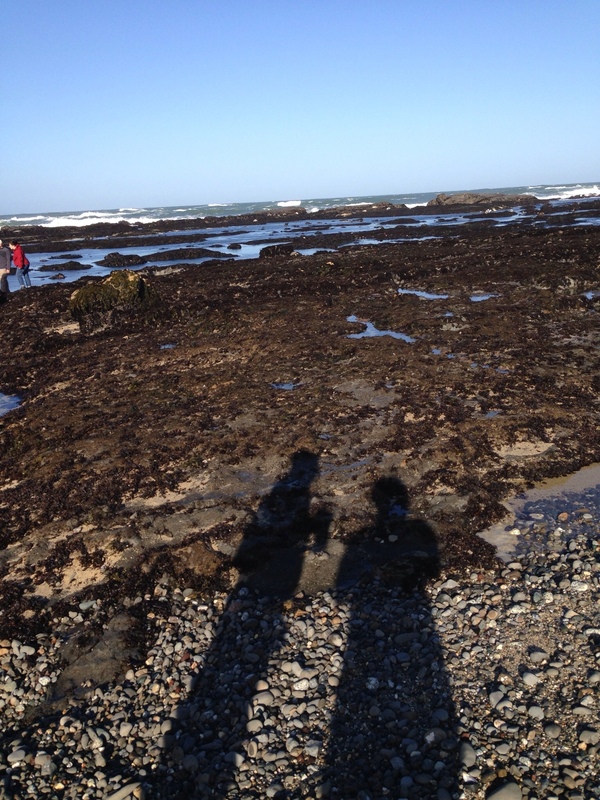 Shadows at the tide pools. Forgive me for rambling, I'm rusty at this. I've been away. Away from the blog, away from home, from myself, even from writing. Irowboat's birthday is in April, and we decided to celebrate with a road trip in my new car to California – traveling to San Francisco and down the coast to Los Angeles, finally ending in San Diego for a few nights before heading home. It was a chance to see friends (including a visit with the fabulous people of The Office of Letters and Light), to eat marvelous food, stare at gorgeous coastlines, and to research some locations for The Novel. We had an amazing time. There were long walks, speakeasies, The Golden Gate Bridge, winding roads with no cell phone reception, tide pools, ghosts in hotels, caves used by smugglers and pirates of yesteryear, beaches at sunset, books by Douglas Adams on the car stereo, time with each other. And, of course, amazing friends, new, old, and in-between. There was a day spent glued to television and twitter when bombs went off in Boston, the surreal contrast of our Great Vacation against the horror and fear of the news. There was an impromptu stop at Monterey Bay Aquarium, hunts for clam chowder on the coast, adventure. I barely wrote a word. It gave me distance, this trip. It gave me time in air thick with history and wonder, time in the places my characters know and love and remember. Time away from myself and who I'm used to being. That distance gave me the chance for all this writing, all this dreaming to change me, and I've returned different. I'm new, born into myself from the new reality of writing, wanting to write, afraid and excited by all I have to learn. I can't help but think back to last year at this time. I was frightened, troubled that I might not make it. My insecurities lashed at me like tide on sharp rocks, catching me up in waves I thought might drown me. I knew I would never be the same – I could feel it as I wrote myself real. I've been feeling the changes in me, feeling the strain between who I was and who I am yet to be. This trip, this distance from my everyday, has broken the bond with the past. I'm floating free. I don't know how to do anything anymore, not like I used to. I don't remember how to blog or to write, I have piles of emails to reply to and comments to answer and things I want to write and share here and elsewhere. And a novel to do. I don't know where to begin. Not even a little. So I begin here, with you. What is clear to me is that I'm ready to more myself. Here, elsewhere, anywhere. I can feel it, the desire to hold things back. I've given in too often, and fallen silent instead of saying what I wanted to say. But the time for that is over. Now it's time to get more real, and more serious. Time to do What I Never Thought I Would. I'm ready for this, whatever this is. I'm ready. Thank you! California is a magical place, to be sure. Nostalgia is a good thing. Wonderful to lose yourself and maybe find yourself doing some fun things and just following your instincts. It will all add to the quality of what is to come. I absolutely agree. It seems the heart of the artist is all about losing and finding over and over, yes? Always discovering something new. I’ve been working on the beginning of my novel for a couple months now and all I can say is: Beginnings are awkward, muddled places to be. Not knowing how to start is part of the territory and the key to success (I’m hoping) is having the faith to keep showing up and working at it until you find your way. Sounds like your time away was a great chance to refresh, renew, and re-vision. Good luck with The Novel! Awkward, muddled places indeed! I totally agree that not knowing is the key. If you know everything already, what’s the point on continuing? I like the discovery and the lost feeling, in a sick kind of way. The mental illness of our ilk, perhaps.